Everyone keeps telling me how well I look recently and I feel good, so everything I am doing must be making a difference. So, I’m going to go over what complementary therapies I use for anyone that might be interested. I was planning on posting something I’ve written all about the health and fitness industry, gym culture and trends but after much deliberation and editing I decided against it because it was a bit of a rant, so you have this more informative post to read, even if it is less fun. Firstly a quick update on my journey. Im currently having round 4 at home. Due to the travel distance and the type of chemo I’m having this service has become available. This means no more daily visits to Southampton Hospital, which has become a second home and a place I despise. Forgetting how nasty chemo is, its so nice to have it at all done at home. Its so much more relaxing, clean, peaceful and allows me to live a more normal life, so I’m very happy about this. This chemo makes me feel ill the week during and for a few days after, but generally I feel a lot better after that compared to last year. Also I still have my hair..happy days! Its a lot tougher mentally now as I don’t have a finish line to aim for and its also extremely draining after so long. I am due to have another scan in two weeks before the next round so fingers crossed for some positive results to give me a morale boost. That time of year has come around again where summer is approaching fast, everyone is out exercising more, going off on sunny holidays and I’m just strapping into my 14th month of chemo and doing whatever I can to make the most of time between rounds. The plus side of this is I have started a little project landscaping the garden. I feel about 30 years older than I should and after this past year I want to go on holiday and not come back. This past week I’ve had to miss a holiday to America with my friends (which was a gift from them), give away my Glastonbury ticket and then learnt some very tough life/relationship lessons but Im not dwelling on that anymore as I have bigger fish to fry. Luckily I am blessed to have such a great family and friends around to pick me back up. Before I got diagnosed I hadn’t ever had a sick day, I cant remember the last time I even had a cold. So to be told I have cancer for a second time and the chance of beating it is less than 10% is very difficult to accept and understand. Ive always felt indestructible. It changed everything and flipped my world upside down, and now my world is very different and sometimes a much darker place…sounds a little depressing but thats how it is. Ive always had a rough idea of my future plans and ambitions but it changes all of that and just leaves questions. Ive lost so much from my life that gave me my identity and made me who I am, so I’ve had to do some serious soul searching to try and find out who I am without it. My body has failed me so I’m trying to keep the mind strong, but thats hard, even my brain has been fried. You have to do everything you can to keep it strong, positive and happy while going through chemo, or in any walk of life for that. Ive looked after myself my entire life and I haven’t got a history of cancer in the family, so getting diagnosed made me look over my life for answers with a fine tooth comb. There are so many theories about what causes cancer and what cures it. Some of the theories are extremely frustrating and would make anyone confused and angry that has to go through chemo, or watch a loved one going through it. You have to take everything with a pinch of salt and decide what works for you. Its so important for moral and mental health to do everything you can. My diet has always been very healthy but now its become extreme and I’m using food as medicine. When I first started to read up on what helps reduce the risk and also fight cancer things such as drinking green tea, eating lots of leafy greens, lots of fruit and veg, lots of water, no processed foods or sugar, regular exercise and no smoking pop up time and time again. These are all things I already do, so I had to look into what other steps I could take. My diet and lifestyle have become a constant war against cancer from the second I wake, to when I go to bed. This can be a real drain and consumes life sometimes when you also include the daily injections, dressing changes, line cleans, blood test, checkups, scans and treatment. Some things I do may seem odd but when you’re given such low chances you do everything you can. The chemo makes me feel worse than the actual disease and drains the life and energy out of me, every cell in my body gets attacked by the chemo. I can’t stand feeling weak so a lot of the little things I do are just to keep me as healthy as possible. Aint nothing bigger than the little things! According to statistics half of you reading this will get cancer in your live time. Im sure its becoming more and more prevalent and there are a lot of theories behind it, but I strongly believe that the modern world and lifestyle have a lot to do with it. 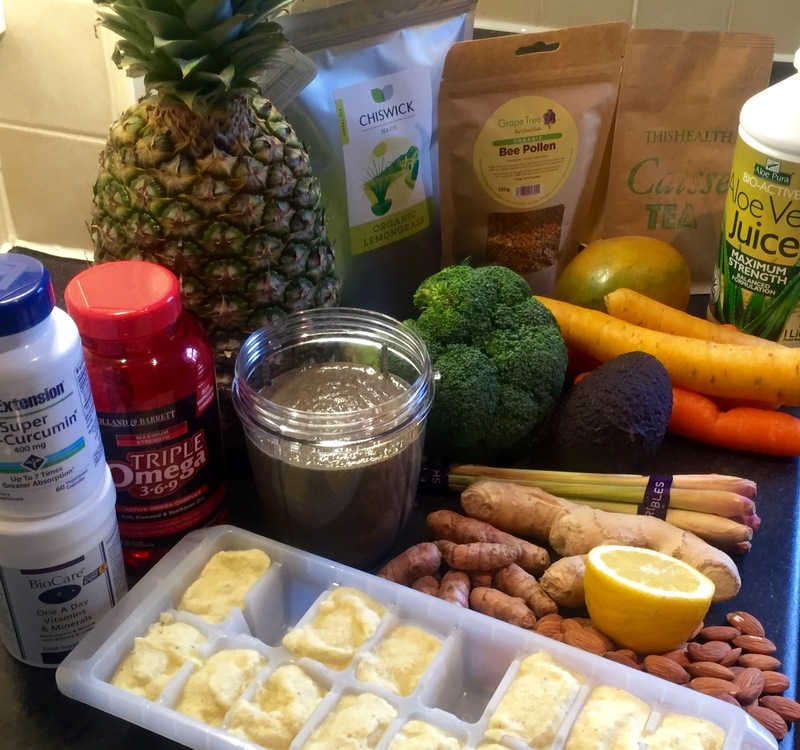 I try to reduce the amount of bad stress I am exposed to, chemicals that I consume and also maximise my nutrition which all help keep my immune system as strong as possible. The NHS and Cancer Research don’t promote holistic therapies and only encourage/fund the orthodox stuff so always do your research. For example the Cancer Research website states sugar does not feed cancer but they have recently licensed a drug used in diabetes, that reduces blood sugar, for cancer patient. I could talk about my lifestyle and diet till it becomes boring, so instead I will quickly mention some of the things I do. If you would like to know any more information then don’t hesitate to ask. Lemon and baking powder- Before I eat anything in the morning I have a mug of warm water with the juice of half a lemon and 1 tsp of bicarbonate soda. Its tastes warm and salty. This is a great way to boost the alkalinity of your body first thing. Everywhere I look there are contrasting opinions on whether or not you can change the pH level of your blood with diet but time and time again the Alkaline diet has popped up as a great way to give cancer a hard time. The idea behind it is that cancer has been proven to thrive in acidic environments and struggle in alkaline environments. Morning green smoothy– I have an alkaline smoothie every morning which includes everything I need, and lots of anti cancer properties! The smoothie includes homemade almond milk, banana, kale, frozen blueberries, aloe vera juice, hemp oil, bee pollen, chia seeds, flax seeds, a good quality green powder and some oats. Its easy to get down me when I am not feeling well and the days I am feeling better I will have a couple of hard boiled eggs, just to up my protein intake. Turmeric tea- Every morning I have my SpecialiTea that I have developed and you may have heard me preaching about before on my Instagram or this blog. It consisting of hot water, turmeric, cinnamon, coconut oil, lemon juice and black pepper with optional ginger and honey if you want to sweeten it, but I’m avoiding sugars. I also have turmeric capsules with a pinch of black pepper before bed. Exercise- Its so important to get out in the fresh air and sunlight when you can. Not only is it important for your mental state but to also boost your vitamin D levels. Getting out in nature is key, so I get out twice a day with the pooch! And it also releases feel good hormones. Walking has never been classed as exercise to me before but its enough for me at the moment, along with some shoulder rehab. Ive sometimes even got enough energy in my good week to do some body weight stuff which makes me so happy. Yoga, meditation and mindfulness- I miss training and sport more than anything, I cant begin to explain how much I miss it. It has always been who I am, so I have been doing some serious soul searching trying to find out who I am without it. A lot of people suggested yoga and meditation. It has so many health benefits you wouldn’t even realise. I don’t practice it nearly enough as I should but I do try. I have a great app called Headspace for anyone that wants to be more mindful and practice some mediation. I exhausted all the YouTube videos during sleepless nights so this app is great. Also a great website called ROMWOD for something a little less yogi. Avoid stress- Stress and negative emotions like heart break, anxiety and worry have been shown to suppress the immune system and even alter our DNA, so Im doing my best to avoid this. Being an over thinker doesn’t help! Lemon grass tea- I have a mixture of fresh and ready made organic lemon grass tea every day. There is evidence from Israel that it has an anti cancer effect. Jamaican Guinea Hen Weed Tea and Essiac Tea- Both teas claim to benefit chemotherapy and fight cancer. Neither taste nice! Alkaline diet- Or the no fun diet. I have mentioned the benefits of keeping your body in an alkaline state already. Everyone would benefit from it. The alkaline diet includes lots of vegetables, seeds, some nuts, pulses, some fruit and very little animal protein and excludes red meat, gluten, dairy, tea, coffee, alcohol, sugar and processed food. They say aim for 80%-20% but I try to be as perfect as possible and treat myself every know and then, so hopefully more like 90%-10%. Anti angiogenesis foods- Angiogenesis is the growth of new blood vessels. We all have mutated cells in our body that are constantly being disposes of. Cancer occurs when these mutated cells get a blood supply. Its has been proven that there are certain foods which decrease angiogenesis and cut off the cancers blood supply. I do make exception to the alkaline diet if its these type of foods. Some examples are berries, apples, tuna, red wine, mushrooms and dark chocolate. Avoid non stick pans- Non stick materials release toxic chemicals, especially when used in cooking. I try to keep to stainless steel, iron, glass or ceramic. Also I try and avoid eating and drinking from anything plastic to reduce the amount of chemicals that I consume. Further more you can also use wooden or metal utensils to avoid plastic. Organic produce- I always eat organic where possible and avoid unhealthy cooking oils. This makes eating out harder, so this is usually the time I have that 10% of acidic food and treat myself. If organic produce is grown as natural as possible then anything else is un-natural and should not be the norm. You wouldn’t put the wrong fuel in your car which you also spend a lot of money on. So why put food that has been sprayed with chemicals in your body, just because its a bit cheaper. Meat and dairy are the same. Unless its organic it gets pumped full of hormones, antibiotics and fed on GMO food which is also full of more chemicals. You are what you eat apparently. I eat a lot of mushrooms because I’m a fungi and they are cancer fighting. Especially shiitake! Toiletries and cleaning products- I have swapped to using as many natural alternatives as I can to reduce the amount of chemicals that I come in contact with. Have a quick search and there is a huge list of carcinogenic chemicals used in a lot of products. Also many of the commonly used brands test on animals and leave toxic chemicals in the environment. I read an article recently on how consuming too much sodium fluoride can cause bone cancer, so I now use a fluoride free toothpaste. Multivitamins- I take a good quality multivitamin and vitamin C tablet daily to boost my overall health and immune system. Turmeric- Ive mentioned the benefits of this wonder spice in a previous post and you can follow the link here. It also includes a few recipes. Omega 3 and 6- Omega oils help reduce inflammation and keep cells healthy. Although modern diets are too rich in Omega 6, which is found in meat and dairy, and thought to be a cause of inflammation. Its believed that modern intensive farming increases omega 6. Herbalist- I see a great herbalist who provides me with a mixture consisting of echinacea, milk thistle, passion flower, oats and dandelion root, which I have daily. These ingredients help boost my immune system, aid my liver and boost my mood apparently. I will never know if this stuff works but I like doing it because it makes me feel good knowing I am doing everything I can. Essential oils- I have read into how effective oregano oil is because it is a natural antibiotic and has antimicrobial properties. I use this in an oil burner to help reduce the risk of any air born bacteria and clean my lungs. Plus it smells nice! There are a whole variety of essential oils and they all have different benefits apparently. Frozen lemon and ginger- Both help clear toxins from the body, anti cancer, anti microbial, increase pH levels in body and taste good. I blend whole organic lemons (rind included as that contains a lot of the beneficial limonoids) and ginger in the Nutri-Bullet and then put them into ice trays so I can add them to my water. Helps to add a little water to get the blender going. Alkaline sticks- Order offline to increase the alkalinity of water. Something sciencey to do with ions. Water filter- Reduces the amount of metals, chlorine and bacteria I consume which cause internal stress on our bodies. Imagery- I think imagery is beneficial in anything. Its something I have always used in my sport and learnt about at college and uni. It may sound stupid but I actually image the cancer cells being consumed, burnt and destoyed. Imagery helps keep a positive mental attitude and even the placebo effect has been shown to be beneficial in many areas, so why not in our thoughts! Electrical pollution- All electrical devices give off an electromagnetic field. Exposure to this can cause hormonal changes and effects our nervous system. The worse culprits are devices like phones and tablets, so I try not to keep mine on me for too long and always place it down when I get home. I swear it makes me feel better and clearer, although that might also be from avoiding hours wasted on Facebook. Vitamin D- There is research being done that suggests vitamin D can prevent and even kills cancer cells so get out in the sun whenever you can! 30 minutes a day is the recommended exposure to get enough of the D.
Tongue scrapper– Something very simple I do before I brush my teeth, It removes toxins from my body. They can be bought online. I hope this little insight into what I do to fight cancer was interesting. Ive tried to kept it brief so if you would like to know anything else then just give me a holla. Julian, you are incredible. Mate ive never felt so emotional reading a story as this. You are an inspiration and are clearly extremely driven. This sort of education can not be bought and is inherited and you have embraced it mate. The last 2 years ive started alot of these techniques and do get alot of stick from housemates for what they seem weird (making my own toothpaste) #coconut oil is God. Il always try an inform as many people of these techniques and may i ever hope to find someone as driven as you. I wish you all the best. What an incredible journey. May i ask, do you use Chlorella, Spiralina? Hi Micheal, thank you for reading it and your kind word. I use a green powder mixture that includes chorella and spiralina. All the best, J.